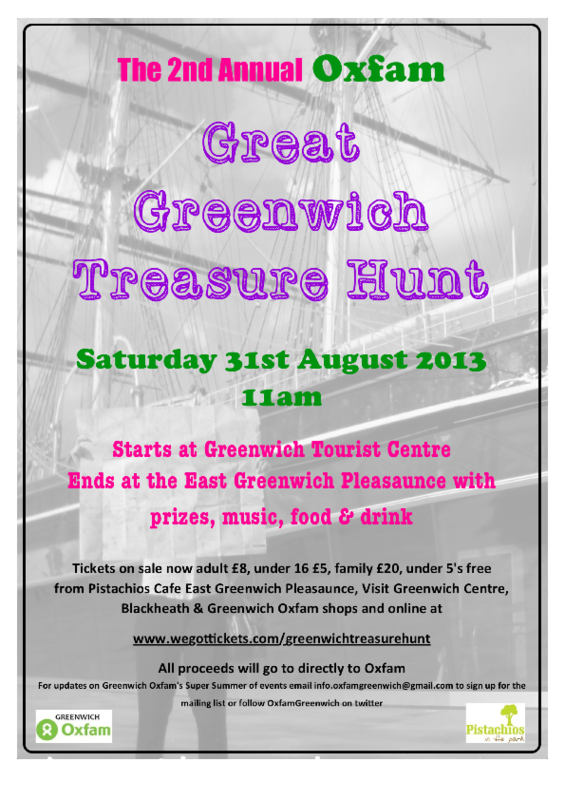 On Saturday 31st August the Great Greenwich Treasure Hunt will take place in and around Greenwich town centre. It will be a fun day out suitable for all ages. Teams will be given a number of questions to answer by searching for clues in Greenwich and the area surrounding it. And this year we have a wider area to explore now that Greenwich Park has re-opened after the Olympics. There’s some great prizes up for grabs too, including a football signed by the current Charlton Athletic team and more to be announced soon. The treasure hunt will end at the lovely East Greenwich Pleasaunce Park where there will be live music, a bar & food on offer at Pistachio’s Cafe. Tickets are available now via the below link, places will be limited so book in advance to avoid disappointment. Adults £8, under 16’s at £5 and family tickets (up to 2 adults & 2 under 16’s) are £20. Under 5’s are free. Teams can be any size as tickets are per person. If you would like to be teamed up please email info.oxfamgreenwich@gmail.com in advance. The ticket price includes a goody bag with discount vouchers for local businesses to be used on the day or in future. All ticket proceeds will go directly to Oxfam. Participants should arrive at Greenwich Tourist Office to collect their treasure hunt packs between 11 & 11.30am on the day. The prizes are expected to be given out at around 2.30pm with the live music following this. 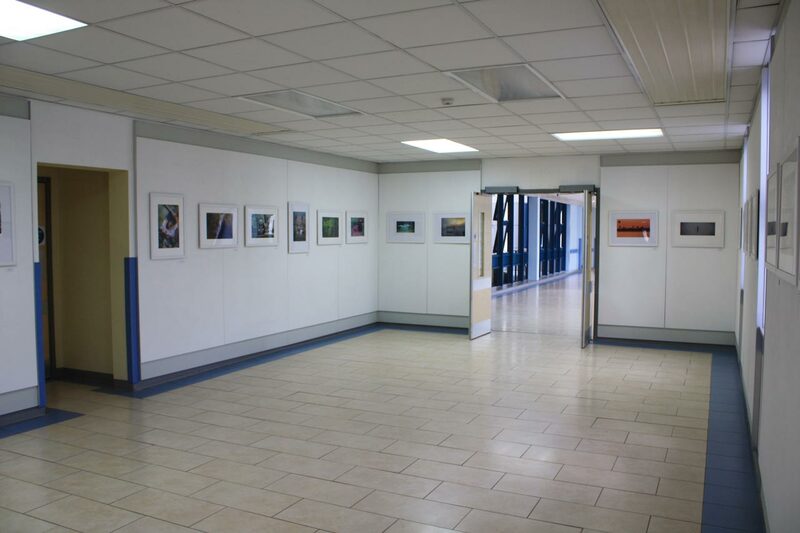 The aperture Woolwich Photographic Society’s latest photography exhibition is now on at the Elixir Gallery in Queen Elizabeth Hospital. The free exhibition is reached by turning left inside the main entrance of the hospital and walking along the corridor past the fever bell and up the slope. It includes some prints from the Charlton House exhibition in July plus some new ones from aperture members. 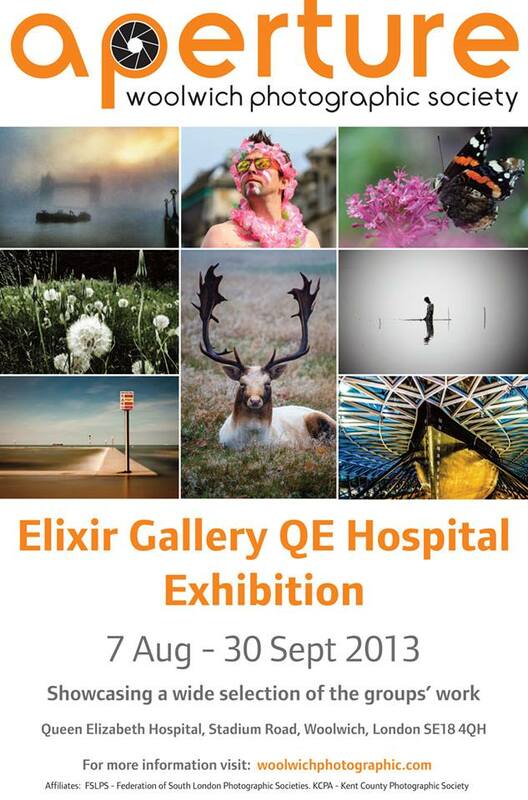 The exhibition runs until the end of September. aperture have also announced details of their “Bridge Programme” which starts next Tuesday (3rd September) at 7.45 in the library at Shrewsbury House. It’s called the bridge programme because it spans the change in the club’s calendar which used to run from September to May but in future will run March to December. This evening’s meeting will be a social event to introduce the programme and review some of the best images from aperture’s last season. The new programme includes talks by The Flamsteed Astronomy Society about astrophotography and by Graeme Webb about his diorama and miniature photography entitled “A Journey into The Arcimboldi Studios“. “I specialise in maritime pictures as well as aviation,” said Colin Ashford,” and have also painted steam trains and cars.” We were sitting in the front room of the Shooters Hill house where Colin had lived for over 60 years, talking about the water colours he had exhibited in the recent “Aviation Paintings of the Year 2013” exhibition at the Mall Galleries. This annual exhibition is organised by the Guild of Aviation Artists of which Colin is a founder member and Vice President. The Guild was formed in 1971 with the aim of promoting aviation art and now has over 500 members and links with many fellow societies around the world. Colin’s paintings have been a regular part of the Guild’s exhibitions – examples can be seen in their gallery web pages – and he has been awarded their Hawker Siddeley Trophy for the best water colour of the year on more than one occasion. 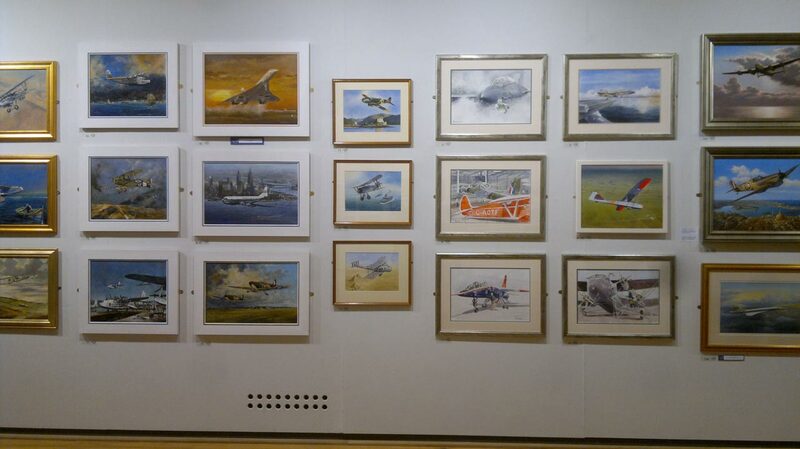 The 2013 exhibition was very well attended on the day I visited, with many aviation enthusiasts viewing and discussing the 446 paintings by 139 artists. Colin was already interested in maritime and aviation art, and while a student spent some time during holidays going out on herring fishing boats from Scarborough to learn more about the subject and make notes on shapes and colours. His ambition to be an artists was interrupted by the Second World War. Colin’s experiences with the First Battalion Scottish Light Infantry as part of the British Expeditionary Force just before the Dunkirk evacuation sound like a story from one of the boy’s annuals he later illustrated. The battalion was assigned by General Gort to defend a gap in the line created by the Belgian’s surrender. After a rapid overnight march through thundery storms they had to dig trenches into sodden clay – trenches that quickly filled with water – and then hold off a superior force including two Panzer divisions, with only light weapons. They held out for 24 hours, but Colin was wounded in the leg and taken by truck to the Belgian town, Poperinge. They could go no further because the bridge had been blown up to hinder the enemy’s advance. Colin managed to get a lift in a tracked bren-gun carrier, on the understanding that he was capable of firing it, and was taken back into battle despite his wound, though with an artillery unit this time. Again this only delayed the inevitable and he eventually had to wade shoulder deep across the river between the spars of the demolished bridge in order to get to the coast for evacuation back to the UK. After two days on the beach he was taken home. Colin was in hospital for three months recovering from his wound and shell-shock. 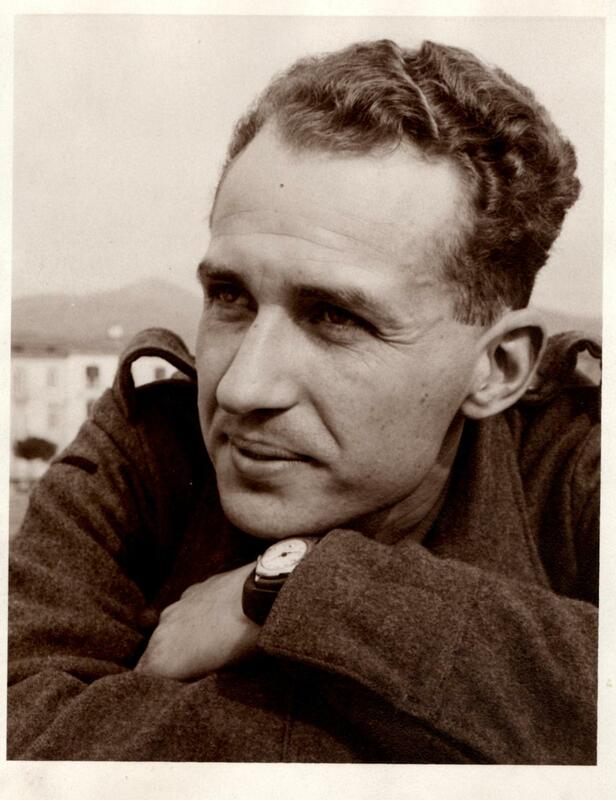 He was redeployed to the Royal Engineers and served in North Africa and Italy, using his artistic skills in camouflage development – a subject on which he later gave talks and appeared in a TV programme about. His deployment included some time at the Allied Middle-East HQ, based in the Royal Palace at Caserta, Italy, which was where the photo on the right was taken. Many years later the Royal Palace was used as a filming location for a number of films including two Star Wars episodes, Mission Impossible III and Angels and Demons. After the war Colin moved south to London to pursue his artistic ambitions. He started with a full-time job at a publisher, “the mortgage had to be paid”, but taking art commissions in his spare time. One of his early commissions, in 1959, came from Hunting Aerosurveys who wanted a picture of their predecessor company Aerofilms‘ first aerial photography sortie in an Airco DH.9 aircraft flying over Crystal Palace. This picture was reproduced in a book about building history, where it was seen by a firm of consulting engineers, Freeman, Fox and Partners. They contracted Colin to do artwork of their products, which included major bridge, road and building projects. While we were chatting Colin showed me copies of some of his commercial engineering art work, such as a 3-D, cut-away picture of an interchange on the Hong Kong Metro. The detail and perspective allowed the engineers working on the project to see how their plans would work out and make adjustments if necessary. Another project was to depict an oil rig drilling platform. Colin’s career breakthrough came when Freeman, Fox and Partners decided to put him on a retainer, which freed him to pursue a full-time career as an artist. Accuracy and meticulous attention to detail are key to Colin’s art. He aims to make his paintings historically accurate, depicting events that actually happened, as well as being a true representation of his subject. This means a lot of research into the historical background as well as the appearance and structure of the objects he paints. He has built up a library of books, photographs and even plans of aircraft, ships and other subjects of his paintings, and sometimes uses pilots’ combat reports. Manufacturers, many of them no longer in existence, were happy to send photographs and plans as part of their PR effort. Colin has also perfected his own water colour techniques over the years, experimenting in different uses of the medium to get the desired effect. He feels water colour is one of the most difficult media to master. 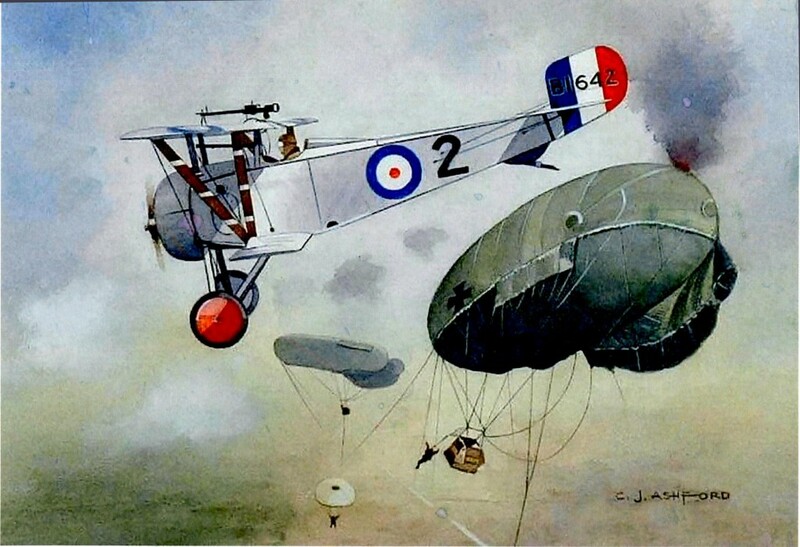 An example of Colin’s work in water colour, with both an aviation and a maritime theme, is shown below: an incident from the First World War when a Blackburn Kangaroo aircraft of No. 246 Squadron RAF flown by Lt E. F. Waring bombed a German submarine, SM UC-70, near Runswick Bay, Yorkshire on 28 August 1918. Although Colin prefers water colours he also sometimes paints in oils. One of his large oil paintings, a Lancaster bomber in a brooding, moody sky, is in the Yorkshire Air Museum at Elvington, another is in the Hendon RAF Museum. His paintings are in various museums around the world. The National Maritime Museum has a water colour of the first catapult launch of an aircraft from a ship. Sir Peter Jackson, the film director, seems to be a big fan: there are 30 of Colin’s paintings at the Omaka Aviation Heritage Centre in New Zealand which Peter inspired, chairs and helped set up. Other interesting commissions have included a series of paintings of cruise liners for an executive from New York who wanted water colours of the liners he had sailed on, pictures of vintage sports cars for their owners and paintings of Thames tug boats commissioned by their skippers. He spent time travelling on the Thames boats to gather information for the paintings, and also captured details of Thames-side industries that have now been replaced by housing. As well as paintings Colin has created a wide variety of different artwork over the years. This includes book jackets, magazine covers and postcards. 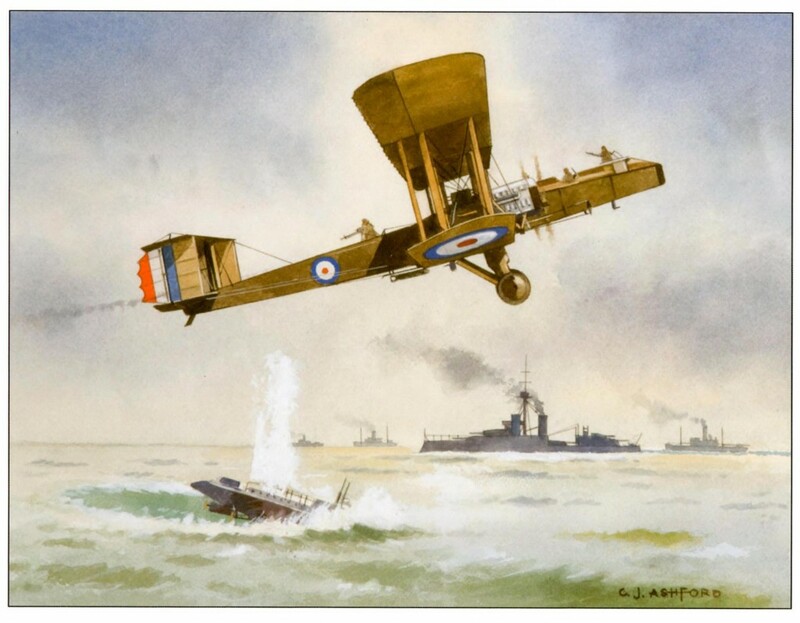 He has contributed a number of covers for the magazine of Cross and Cockade, the First World War Aviation Historical Society and pictures for aviation books published by the RAF Benevolent Fund such as Wright to Fly. A set of transport post cards utilises Colin’s ability to paint and create lettering in the style of the 1930s. At auction and on art sale websites Colin’s art sells for more than its original price. 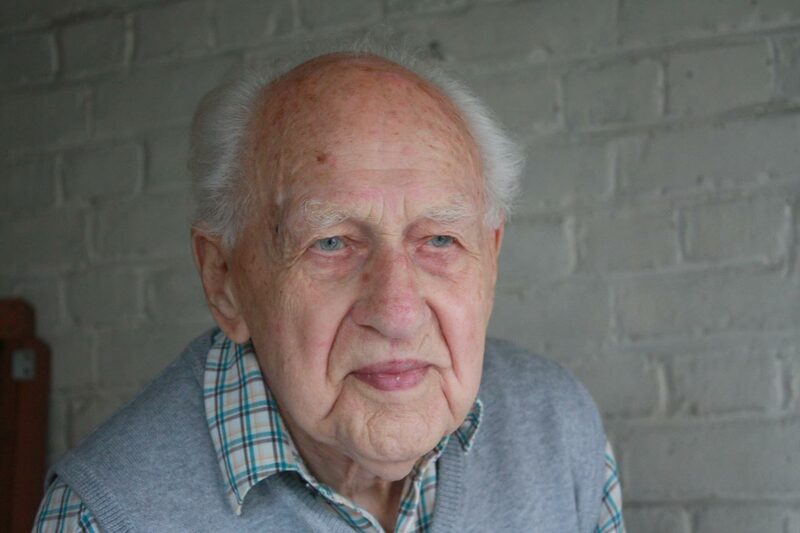 At 94 years old Colin continues to paint in the studio adapted from the garage of his home on Shooters Hill. We really would welcome your help and support to ensure that the pond and wildlife meadow continue to flourish. If you can spare some time to help with weeding or litter picking it would be very much appreciated. We know from comments received from visitors to the park that the pond area provides a wonderful focal point and is much valued by the local community. It is also attracting a wide range of wildlife. I like to think of it as “the little oasis on the hill” and believe there is so much potential for further development. It would be really terrible if everything became overgrown and neglected. 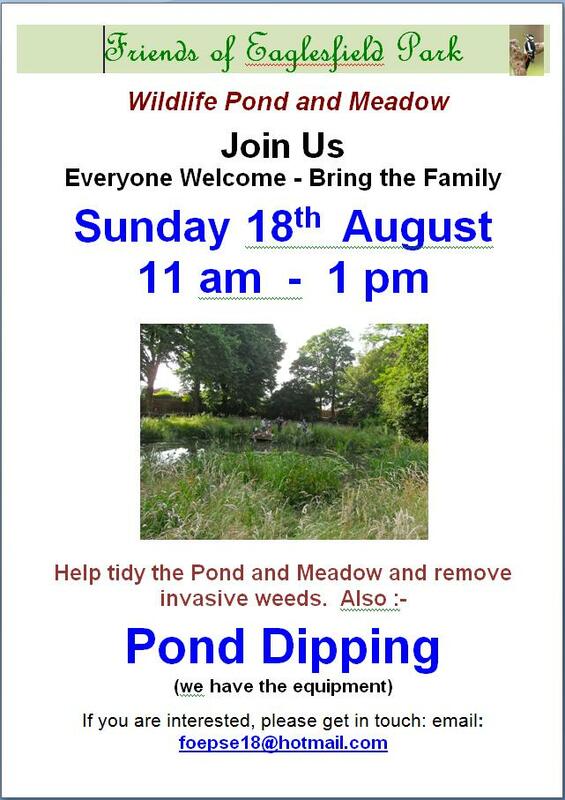 We are meeting Sunday 18th August between 11 am and 1pm to carry out pond and meadow tidying up. Could you join us, whatever time you can spare will be helpful? Pond Dipping will also be available, we have the equipment – so bring the family ! The Friends work in the park was recently recognised with the award of a Green Flag by environmental charity Keep Britain Tidy. Come and have a go at our orienteering course at Woodlands Farm; can you find your way around without getting lost? £1 per child, accompanying adults free. Drop in any time between 10am-2pm. Have a go at this traditional craft, to make lovely corn dollies to take home with you. 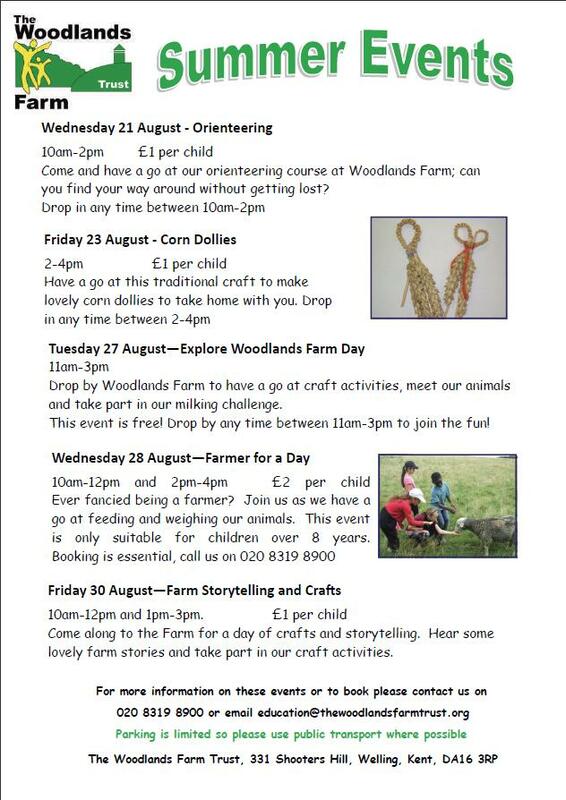 Drop by Woodlands farm to have a go at craft activities, meet our animals and have a go at our milking challenge. This event is free and you can drop by any time between 11am-3pm to join the fun! Come along to the farm for a day or crafts and storytelling. The farm is a place full of wonderful stories so come along to hear some lovely farm stories and take part in our craft activities. 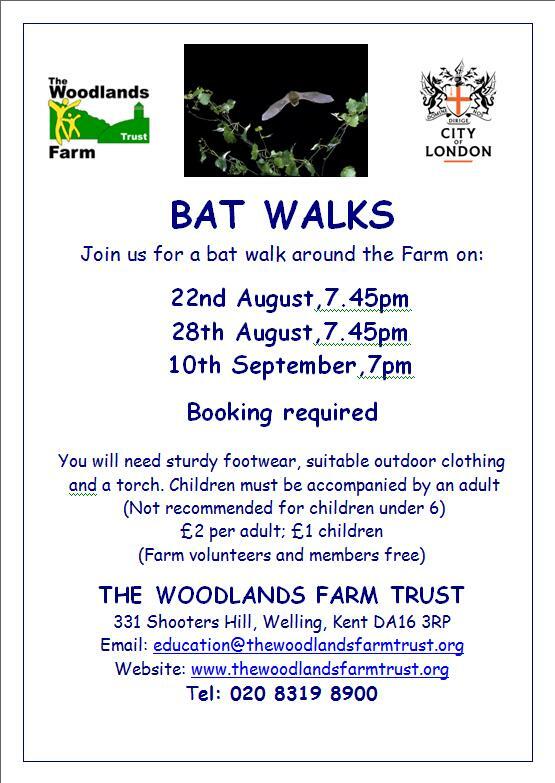 Join us for a bat walk around Woodlands Farm. We have a number of different bat species living on the farm so this is a great opportunity to find out more about bats and see what we can find. You will need sturdy footwear, suitable outdoor clothing and a torch. This activity is not recommended for children under 6. £2 per adult and £1 per child. Booking is essential. To book call 020 8319 8900. 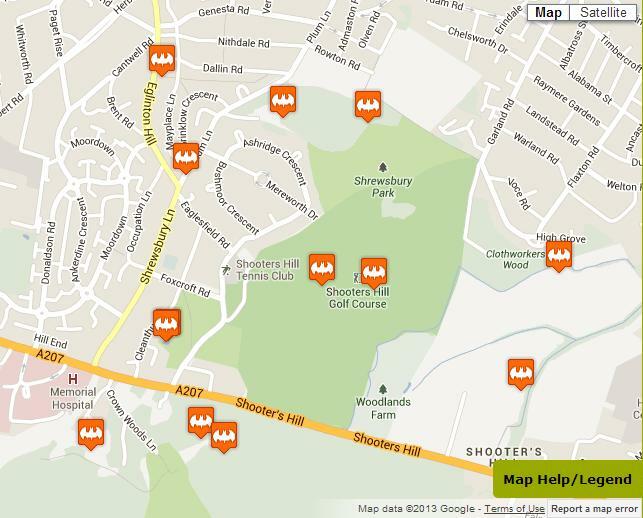 Shooters Hill is a great place for bat spotting, and they have been seen or detected at various locations around the hill as can be seen in the Bat Conservation Trust‘s Big Bat Map, Shooters Hill snippet above. 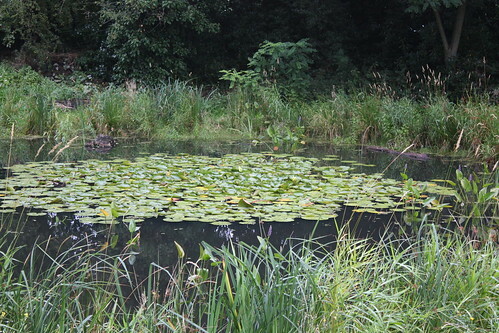 As well as the Common and Soprano Pipistrelles seen in Shrewsbury Park on the Friends’ bat walk, the two Pipistrelle species, Noctules and possibly Leisler’s bats have been detected in Oxleas Wood and Soprano Pipistrelles regularly forage over Eaglesfield Park Lilly Pond. Woodlands Farm contribute to the National Bat Monitoring Programme annual survey, which means they look for bats on a transect route of 12 walks and 12 stops at the beginning and end of July each year. This year they detected quite a few Common & Soprano Pipistrelles and Noctules, which bodes well for their bat walks. This list is compiled from the “List of Mammalia” in the “Fauna of Blackheath,” published in 1859; the “List of the Mammals of Bromley, Kent,” published by the Bromley Naturalists’ Society in 1895; a ” MS. List” from A. S. Kennard ; and a “MS. List” from B. W. Adkin. It will be interesting to note that several species, now very rare or extinct in the area, were at one time even common in the heart of the district. B.W.A. = B. W. Adkin. A.S.K. = A. S. Kennard. Fn.B. = Fauna of Blackheath. B.L. = Bromley List, mainly A. S. Kennard’s records. Vesperugo noctula, Schreb. Great Bat. Common all over district, Hayes (A.S.K.) ; Lewisham, rare (B.W.A.). Vesperugo serotinus, Schreb. Serotine. Occurs (Fn.B.). Vesperugo pipistrellus, Schreb. Common Bat. Hayes (B.L.) ; Blackheath and district, very common (Fn.B.) and (B.W.A.). Vesperugo leisleri, R.- Hairy-armed Bat. Chislehurst (A.S.K.). Vespertilio mystacinus, Leis. Whiskered Bat. 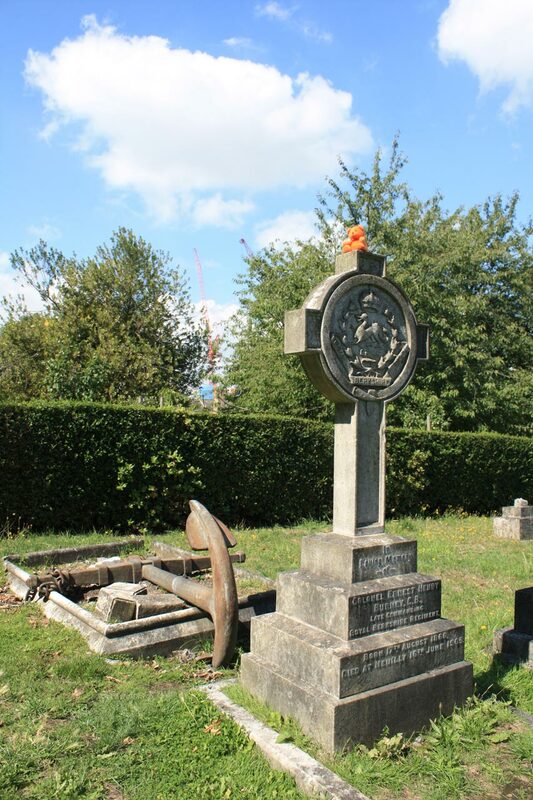 Chislehurst (Fn.B.). Vespertilio nattereri, R. Natterer’s Bat.Chislehurst (A.S.K.). Plecotus auritus, L. Long-eared Bat. Chislehurst (Fn.B.) ; Hayes (B.L.) ; Lewisham, fairly common (B.W.A.). ; Beckenham,. 1903 (A.S.K.). Synotus barbastellus, Schreb. Barbastelle. Chislehurst (Fn. B.) ; Dartford (A.S.K.). Rhinolophus ferrum-equinum, Desm. Greater Horseshoe Bat. Hayes, 1904 (A.S.K.). Some names have changed: the Noctule is referred to as the Great Bat, which is fitting for one of the UK’s largest bats, the Pipistrelle is called the Common Bat which is also apt as it is the most common in the UK and Leisler’s bat is the Hairy Armed Bat. Also at that time it wasn’t known that there was more than one Pipistrelle species, and that the Common Bat was two species: the Common and Soprano Pipistrelles. That wasn’t certain until 1997 when it was confirmed by DNA analysis. 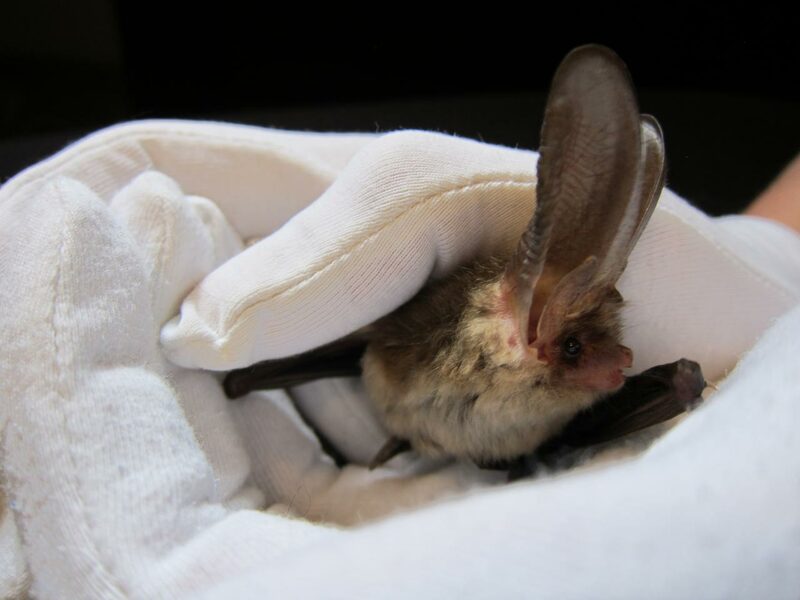 The Long-eared Bat was “fairly common” in the 1909 Woolwich Surveys, and the Brown Long-eared is still common throughout the British Isles. It is quite difficult to detect because its echolocation calls are very quiet, and my bat guide says it is more often seen than heard on bat detectors. They are such amazing looking creatures, with ears that are almost as long as their bodies, that they are definitely one to look out for on bat walks in the woods.